There was always something magical about the sweets of childhood, zingy flavours combined with rainbow colours and a sense of wonderment as to how such an item could possibly be created. Now older and wiser I've since learnt how to recreate a few of my childhood favourites myself, they taste even better when made by hand with fresh ingredients. 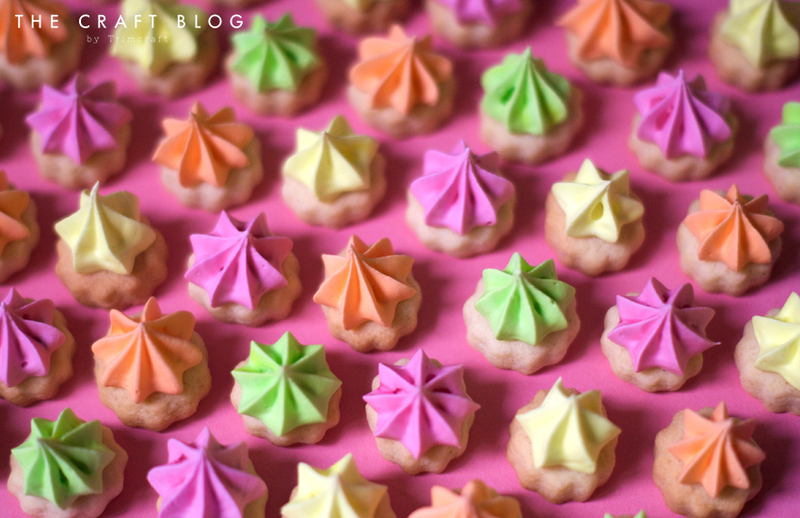 So, with a healthy dose of nostalgia, we give you DIY iced gems, ready to recreate a few delicious childhood memories in the comfort of your own home. Makes 80 to 100 biscuits, depending on the size of your biscuit cutter. 1. Pre-heat oven to 195°C/180°C fan/gas mark 4. 2. Line a large baking tray with non-stick baking parchment. 3. To make the sugar cookie bases, place the butter sugar and vanilla together in a mixing bowl or the bowl of an electric mixer and cream together. 4. Beat in the egg along with half the flour and beat to incorporate. 5. Fold in the remaining flour and mix until you have a smooth dough. 6. Tip the dough out onto a well-floured surface and roll out to a thickness of 7 - 10mm. 7. Use the fluted cutter to stamp out the biscuits and place onto the baking tray. 8. Bake the biscuits for 7 - 10 minutes, until golden brown. 9. Allow to cool completely whilst making the royal icing. 11. Place the egg white into a mixing bowl or the bowl of an electric mixer. Whisk the egg white until it begins to froth then slowly add the icing sugar, a spoonful at a time, mixing well between each addition. 12. Fold in the lemon juice and glycerine, continue to whisk until the mixture is thick and forms stiff peaks. 13. If adding colouring, divide the icing equally between bowls so you have a bowl for each colour you wish to make. Add the colouring to each bowl, a little at a time, until you have the desired depth of colour. 14. Insert the star nozzle into a piping bag and spoon the icing into the bag. 15. Pipe a little star atop each of the biscuits. 16. Allow the icing to set completely, ideally overnight, before serving. Sugar cookie dough can be made in advance and frozen for up to three months. If you have any leftover pop it in the freezer for rainy day baking! Royal icing is available in ready to use format from most supermarkets and comes in a variety of colours, just in case you don't fancy making your own. It also goes by the name 'piping icing' in some shops. If baking for children try to use natural colourings that don't contain E numbers. My current favourites are available online here. Will you be making Elle’s DIY Iced Gems? We’d love to see if you do, so don’t forget to #Trimcraft and to tag @elle_jane_ when uploading to social media. We’d also love to see your yummy makes in the Inspiration area.